2 scoops of vanilla Naturade Total Soy, 1 cup of fat-free vanilla yogurt, 1/2 -1 cup of frozen berries(single berry or mixed), 2 dollops of fat-free vanilla yogurt, 2-4 berries for garnish. Put first 2 ingredients into blender and pulse a few times. With blender running, add berries a few at a time until thick and smooth. 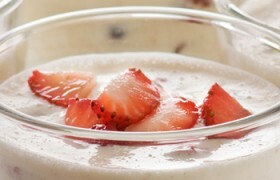 Scrape into 2 small bowls, add dollop of yogurt and berries to each bowl and serve with a spoon. Enjoy!